When looking for a financial software package, Intuit would be the first solution to come to our mind. Thanks to their well-known accounting software, QuickBooks, Intuit has today become a key player especially among individuals and small businesses. Most SMBs and CPAs are aware of QuickBooks software, but did you know that Intuit provides payment solutions as well? In fact, the Point of Sales solution provided by Intuit – called as QuickBooks POS, are among the best POS options in the market. QuickBooks POS is integrated with QuickBooks software and allows businesses to enjoy many features such as customer management, tracking inventory, automate overall banking process, and employee management. It offers on-premise, web-based and mobile POS solutions for businesses of all sizes. According to an Intuit representative, QuickBooks POS is planned to attract two types of users: experienced sellers who want to set their own shop and experienced sellers who want to set up a new system for their existing outlet. The new version of QuickBooks Point of Sale is compatible with Microsoft Surface Pro. This provides increased efficiency by letting retailers to carry the POS system throughout the store. With this feature, the employees can go to the customers for payments rather than making them wait in line. With QuickBooks POS, you get access to a dashboard where you can check the sales summary of a department, which products are selling fast, sales graph, and sales over-time. The company has restored functionality for physical inventory scanner, which was previously discontinued. The CipherLab 8000 and CipherLab 8001 have been added back to the list of compatible scanners. With plug-and-play mechanism, users get increased usability. For easy payroll management, the Pro version of QuickBooks Point of Sale can help you track employee commissions and hours and can further send it to other software like QuickBooks itself or Payroll. In addition to that, security functioning lets owners or managers modify access to a particular employee based on his/her employee status. You can also create another group if required. In the new version of QuickBooks POS, you can see your customer’s transaction history and credit information without clicking on the Magnifying Glass icon or More Info button. With the help of Make a Sale screen, you can get additional information about the customer such as History, Account Balance, Notes and Available Credit. With these optimized features of QuickBooks POS, you can get quick information with the help of hover-overs. With its integrated purchase order function, QuickBooks POS makes buying inventory easier for its users. In order to automatically fill PO (Purchase Order) fields, item barcodes can be scanned, which can then be printed out or sent by email. If the arriving order is accurate and complete, it’s just a matter of accepting the PO to add the latest stock into the record. Or else, the ‘select items received’ button would provide you the option to let the PO partly open for the orders which are not complete. With the Pro version of QuickBooks POS, you can automatically create and send email POs according to your pre-set order. Moreover, you can track package status with the Shipping Manager set reorder point by store and deliver proposed to reorder points according to sales. The back-office functionality provided by Intuit’s QuickBooks Point of Sale is comprehensive and provides most of the small business features. For example, the Inventory section can combine views for up to 25 stores; you also have the option to monitor more than one vendor for the particular product type. In addition, it lets you print tags for items which do not have their own UPCs. As one may expect from Intuit, the company offers a robust set of online support services including videos, tutorials, articles, setup instructions as well as support community section. You can also find a dedicated page for Point of Sale Desktop products on their website. Intuit provides phone support from 4 am to 8 pm PT on weekdays, and 7 am to 4 pm PT on Saturdays. QuickBooks Point of Sale would help you keep the inventory updated and organized by mapping with each color, description, ALU, tax status, quantity, UPC, sales price, and vendor. You can check what’s selling and what’s not to help you maintain stock. In case a product is low in quantity, the pre-set order point would prompt the system to inform you that it’s time to purchase more. Moreover, the price of sales can be automatically analyzed according to a stipulated difference in the buying cost. With the style matrix, you can set different colors and sizes depending on the item department, description, and vendor. Each combination of style and size is provided with a unique item number, which makes it easier to edit if required. You can also add non-inventory items to the system like services or fees. QuickBooks POS allows you to monitor sales by the buyer – simply enter a name, email, phone, address and, business. Additional fields can be customized to provide other information such as birthdays, hobbies, or shoe size. With the tracking feature, owners can formulate specific campaigns for marketing and promotion by checking what your customers are buying and who is buying the most. With this information, special coupons or discounts can be set for particular customers. In the pro version of QuickBooks POS, the Customer Center offers different tools for interaction with customers to completely utilize the customer list, such as getting the address to create lists for bulk marketing campaigns, keeping track of reward points to provide good discounts, offering freebies, and carrying out email marketing campaigns. One may find many POS systems in the market, but few are as well-attuned to your company’s requirements as QuickBooks. The features mentioned help improve your company’s management and boost your employees’ ability to meet customer demands. Whether you have just started your business or an established store looking for increased productivity and efficiency, QuickBooks POS has all the solutions your business needs. 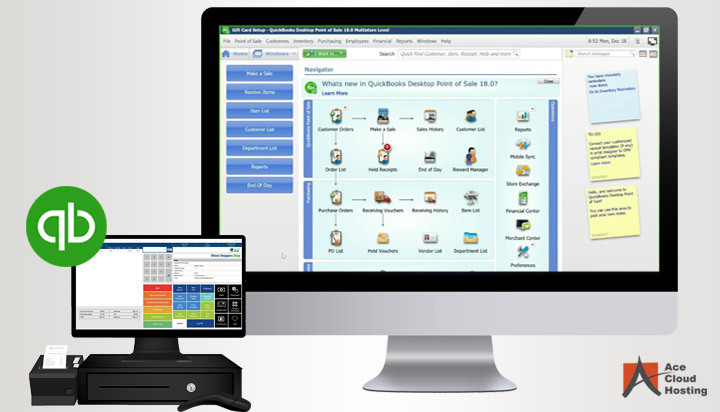 If you would like to know more ways that QuickBooks Point of Sale or hosting QuickBooks POS can help your business and become more profitable, call our solutions consultant at 855-223-4887.